A bust is a sculpted or cast representation of the upper part of the human figure, depicting a person's head and neck, and a variable portion of the chest and shoulders. The piece is normally supported by a plinth. The bust is generally a portrait intended to record the appearance of an individual, but may sometimes represent a type. They may be of any medium used for sculpture, such as marble, bronze, terracotta, wax or wood. Sculptural portrait heads from classical antiquity, stopping at the neck, are sometimes displayed as busts. However, these are often fragments from full-body statues, or were created to be inserted into an existing body, a common Roman practice; these portrait heads are not included in this article. Equally, sculpted heads stopping at the neck are sometimes mistakenly called busts. The portrait bust was a Hellenistic Greek invention, though very few original Greek examples survive, as opposed to many Roman copies of them. There are four Roman copies as busts of Pericles with the Corinthian helmet, but the Greek original was a full-length bronze statue. They were very popular in Roman portraiture. The Roman tradition may have originated in the tradition of Roman patrician families keeping wax masks, perhaps death masks, of dead members, in the atrium of the family house. When another family member died, these were worn by people chosen for the appropriate build in procession at the funeral, in front of the propped-up body of the deceased, as an "astonished" Polybius reported, from his long stay in Rome beginning in 167 BC. Later these seem to have been replaced or supplemented by sculptures. Possession of such imagines maiorum ("portraits of the ancestors") was a requirement for belonging to the Equestrian order. Emperor Commodus dressed as Hercules, c. 191 CE, in the late imperial "baroque" style. ^ Previously known as The Blackamoor. 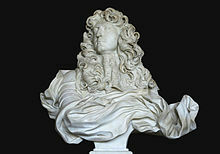 Wikimedia Commons has media related to busts. Look up bust in Wiktionary, the free dictionary.